In the article "Let us commit ourselves to revolutionise this brutal reality," which appeared in the March issue of Battaglia Comunista, we stressed that the war on terror, exploitation, poverty, environmental devastation, are inter-connected phenomena and manifestations of the economic and social crisis. The article we quoted concluded by stressing the need to engage in political terms to bring out the real sense of the alternative society. We will try now to deepen this conclusion a bit more. It should first be said that when we speak of “alternative society" we mean a real alternative. Not simply a reformist improvement of the current economic and social system, but rather a different society that completely replaces that of today. The basis of real change must be the transformation of the economic structure, i.e. the way of producing wealth which humanity needs (goods, services, etc.). Today, all over the world, production revolves around the profits of a few. The same tools to produce and distribute "wealth" are under the ownership and control of these exclusive few. Breaking the link between profit and production, abolishing the ownership of the means of production by the few masters ("public" or private), these are the basic steps upon which a real alternative must be based. The tools to produce and manage wealth should not have "ownership", if anything, they will become ... collective property, placed at the service of the satisfaction of human needs. Only starting from such a transformation will all other aspects of our lives - as a result - really be improved. Any other proposal, which does not embrace these assumptions, is only a fake - and unenforceable - alternative. We are not idealists, we do not imagine heaven on earth, we only think that there is a compelling need for a different society for all humanity, where profit and the exploitation of one person by another disappear, and with them all the brutality that is, in fact, a consequence of exploitation and profit. We are also aware that such a transformation will not fall from heaven, and will confront many obstacles and much resistance. For this reason, this alternative will only have the chance to come about through the conscious and disruptive action of the international working class, which will create its own decision-making bodies, in which there must be maximum participation of the exploited but from which industrialists, bankers, bosses of all kinds, and their servile politicians must be categorically excluded. 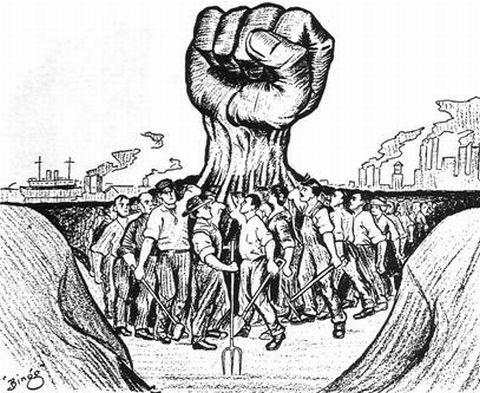 There can be no alternative to the mass action and consciousness of the working class. Of course, looking at the state of confusion in which the exploited class is immersed today, it becomes easy to realise how far we are from such a transformation at the moment. The proletariat, casual workers, all workers and their children are - except for a few individuals - completely under the control of the dominant ideology. The "most committed" are mainly lost following the various fake alternatives (the 5 Stars Movement, Salvini, Landini, etc.) and where such illusions are absent, discouragement and resignation dominate. But this is not surprising. The "few" masters of whom we spoke own and also influence the means of intellectual production: the TV, newspapers, schools, etc. Through these tools a distorted view of reality is propagated, different ideological forms that are the opiate of the exploited class. Among the proletarians today the sense of real alternative society, the communist perspective, is at a record low. This is also due to the defeat suffered at the beginning of last century. The October Revolution should have been the beginning of an international process of transformation of society. But the political revolution in Russia remained isolated. Despite the proletarian turmoil present in different areas of the world, nowhere else were the workers able to defeat the boss class. Even in Russia, given the impossibility of "building socialism in one country", there was no economic transformation in the communist sense and a counter-revolutionary phase opened, from which arose a particular form of capitalism, "state capitalism ". That was a heavy defeat for the international proletariat. When fighting, any defeat must be examined, but the great damage was that defeat was passed off as a victory. For decades, "state capitalism" has been touted by the "Stalinist" ideology as "real socialism". One can also learn from defeats but that false ideology has contributed strongly to hinder any analysis of defeat, creating political confusion among proletarians and many sincere comrades. This is a confusion that is still preserved and recycled in the various "myths" of the left. The icing on the cake was then applied with the collapse of "real socialism”, a collapse touted as proof of the impossibility of building an alternative to capitalism, further destroying the meaning of the alternative itself, making capitalism appear to the eyes of all as the only "possible world", but of course subject to reform within certain limits. Our small organisation was among the few who managed to critically analyse that defeat. Moreover, it remains active, not closing in on itself, always trying to measure itself against the events and struggles that concern the working class, and has made an important contribution over the years to the development of communist theory. But, frankly, we do not like living in the past. We believe we have an important political heritage that can be used, today, precisely to resurrect the idea of a social alternative*. But for us this is not just a slogan, rather it is the political objective we place at the centre of all our activities. * To the extent we can, we are active amongst other workers, supporting their struggles. We give make political propaganda on the ground. We carry out a job of training and debate internally, because we do not believe "myths", even ones about ourselves, and we have no dogmas. We publish newspapers, leaflets, books. We take part with our positions and our independence, in industrial actions and protests. We debate with other comrades. In all these activities we put political clarification at centre stage in the fight against the dominant ideology and we put forward the need for a communist alternative. We are aware of the difficulties. We know that we are far from the development of a process of the communist transformation of society, but we also believe that this alternative is the only possible one, the only one for which it is worth engaging. In the absence of revolutionary conditions today, we must act by setting realistic goals, to help build the political conditions necessary to ensure that one day, that alternative is achieved. Today the major political objective remains the commitment to build the international communist party of the proletariat. Not a parliamentary party and not a party that claims to "make the revolution" on behalf of the class. Rather, an organisation able to connect to the rest of the proletariat, to guide, stimulate it, and at every turn making the meaning of an international communist alternative come alive in terms of a concrete political programme. We are making our contribution, if you are motivated to commit yourself to liberation from the chains of capitalism, then you should start to lend us a hand. The Cinque Stelle (Five Stars Movement) is led by the comedian (obvious qualification for a capitalist politician) Beppe Grillo which attracts voters disgruntled with all the main parties but has no programme. Salvini is new boss of the racist Lega Nord (Northern League) which he has positioned close to the Front National in France and Landini is boss of the metal workers union (FIOM) which recently went on strike against the so-called Jobs Act of the Government of Renzi (who is an admirer of Tony Blair and wants to make the Democratic Left into New Labour). “Really existing socialism was the name given by the Stalinists to the system in the USSR which collapsed in 1990. I have read this article carefully more than twice and would like to offer some views on it and some parallel ones for consideration. ( Please note that although my 'name' for brevity is T34, that should not be taken to mean that a 'Stalinist' view is implied from me.). It seems to me that a key consideration in assessng factors determining what workers decide to do, back in history and today and onwards, should be the contrast between certainty and uncertainty. (In his book 'The Living Brain' W.GreyWalter showed that prolonged uncertainty is bad for people.). In feudal times workers got fed up with the perpetual feuding between barons, so that there was a tendency of relief when they were overthrown by the forces of the king. In 2015 the electorate were uncertain as to what the Labour Party would do or not do, so by a slim majority of low overall vote the Tories won, probably bccause they felt that they had a better idea of what sort of rule would be inflicted on them and wanted to know who and what was in charge, albeit of the capitalist imperialist economy. Political clarification at centre stage, setting realistic goals, a concrete political progrmme, might all be welcomed if what they contained made sense, but do they make sense by now ? In history conditions develop steadily until a boiling point bursts the status quo, but that is no guarantee that what follows will be a great improvement for workers. The 'Our Task Today' article hopes for the best, but there is no recognition that the capitalist owned tehnology has advanced and is advancing so fast that the power of its owners dwarfs that of any previous era in being able to withstand challenges to it. As\Maoists point out, in any case workers in the 'First World' look forward to their pensions, such as they are, rather than revoluionary change. What would probably be useful, as dangers of war steadily grow, would be to keep telling all capitalists that their nuclear attacks would destroy and radiate the millions of cheap labour and customers and render unusable vast amounts of raw materials for which they compete. Whereas there seems to be a sort of ongoing ambivalence and uncertainty about how to respond to the growing volume of immigration, notably and particularly from 'the third world', it occurrs to me that, rather than tentative responses to it, the working class throughout 'the first world' of major capitalist states should not just sympathise with the desperate plight of immigrants, not just raise objections to state limits on immigration, but, instead, openly welcome and encourage mass immigration. Really ? Yes, absolutely. When we recognise that that, by doing so, it will force the issues of proletarian responsibility for the future and destiny of the workers of the world, building massive pressures on the status quo, and tending to increasingly familiarise workers everywhere with exactlywhat is going on and what needs to be done about it, by us, perhaps even then by governments, forced against their traditional opposition to whatever it has been that workers need. Imagine, for instance, the grounds of stately homes filled with modern 'pre-fabs', mass-produced prefabricated homes to begin to meet the urgent needs of both local and incoming workers. whilst also not forgetting space which could be made available in palaces and so on. Ah but, even better ideas ?! What I've said requires a revolution in thnking, not forgetting Mother Teresa ! Yes, the article on Pegida has been noted. If you haven't seen that, please do so, also the articles on Tragedy at Sea and Our Task Today and comments on them. The 'only alternative' to the causes of migration seems likely to take a very long time to implement, even whilst recognising the extent of protests all over the world against the status quo. In view of the current focus, not only by the capitalist media, on the results of large migration into Europe, much of that from the north of Africa, it would be helpful if the CWO could make clear just what it's immediate short-term recommendations might be. Do you visualise any political benefits to workers in Europe likely to be gained from mass immigration ? The brief answer is that there is no short term solution not are there either benefits or penalties for workers already inside "the belly of the beast". The only realistic short term position we can take is to join inthe fight against the ensuing racism and fight bourgeois propaganda against both asylum seekers and migrants. This means,as we have done in the documents you cite, hammering away at the fact that the problem is created by global capitalism's devastation of the planet. Thank you, Cleishbotham, for your reply comment of 2015-06-15 10:38. Thinking over Cleishbotham's comments of 2015-06-15 10:38, ..'the problem is created by global capitalism's devastation of the planet', yes, but not only that. It is too easy to ascribe just one root cause to anything and then leap to focusing on that, however relevant the alleged root cause might seem to be. Lots of factors could be ascribed to evolution or technology or (lack of) education. As regards mass immigration, one substantial cause could reasonably be said to be over-population due to lack of supply and/or awareness of means of contraception, plus cultural tendencies to have large families 'to look after parents in their old age' and so on. In feudal times there were struggles against 'the system', but not only that, also struggles against its effects. Likewise, under capitalism, struggles cannot just be aimed at the whole imperialist system, there are major 'interim' problems until it is superceded by whatever it leads to. Also, it is knee-jerkingly easy to judge something by whether or not it conforms with or affronts the 'teachings' of major ideological tenets, of various political and religious schools of thought, whereas let's always see what things actually concern and affect living people, here and abroad, now. However mass immigration is explained, I don't see any way in which workers in |Britain would benefit from it. On the other hand, perhaps those who can see such benefits to us here would like to tell us what they might be. Having read again the main article, 'Our Task Today', it's not easy (maybe only for me ! ) to see to what extent public owership would change things as much as communists advise. It is assumed that workers immigrating from anywhere should immediately get 'equal opportunities'. The old road in which my old mid terrace home stands is fairly narrow and publicly owned. A few years ago an old ambulance station was demolished, making way for a number of small new homes, each with space to park one car. Some earlier and some new homes have more than one car, so congested competitive parking is the disorder of the day and night. The road could only be widened by demolishing homes. Any parking 'somewhere else' is competitive there too. As the population expands, so will the number of vehicles. When the oil runs out, there could be a good trade in horses, but they don't eat concrete ! By all means call for the demolition of imperialism here if the results here would be welcome. As Dmitry Pisarev said "If a thing can be broken, it should be broken", but that is not so easy in all cases and we should be careful what (exactly) we wish for. There's quite a lot of public transport here already, but bus shelters seldom fit for purpose.